Joey Logano didn’t just win the NASCAR Sprint Cup season opening Daytona 500 last Sunday — he won over a whole lot of race fans who might have thought last season’s success was a fluke. They had reasons to doubt that Logano’s career-best five wins in 2014 might not be the real deal. In his inaugural Cup season back in 2009, he got his first win early and then would go three more seasons before recording a second victory. 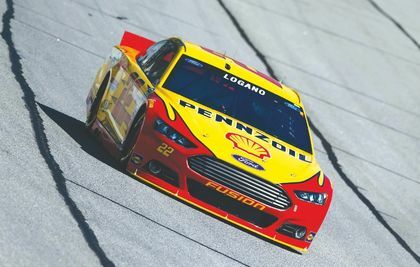 Now, it seems, Logano really is ready to assume the mantle of greatness as he starts on the pole on Sunday at Atlanta Motor Speedway. Atlanta was in fact the site of his coming-out party as a future champion when as a 10 year old, he set a Legends Racing record of 14 consecutive wins at the Georgia track. “It’s been an amazing few weeks if you think about the Daytona 500 and everything that comes along with that and then coming down here to Atlanta and starting first is special, especially for me here at this race track,” he said. “I remember sitting in the corner and watching drivers up here talking about their qualifying run and racing Legends cars out front here for years, so there are a lot of memories here. 1: SUBSTITUTE PART 1 — David Ragan is a two-time NASCAR Sprint Cup race winner with Front Row Motorsports. Now he has a chance in a big-team car — the No. 18 Toyota filling in for Kyle Busch. 2: FRONT ROW JOE(Y) — Picking up where Team Penske left off last season with four front-row starts in the Chase, Joey Logano won the pole for Sunday’s race. Let’s see if he can make it two consecutive wins. 3: LAST DANCE — Jeff Gordon will be making a lot of last appearances this Sprint Cup season after announcing his retirement plans, but Atlanta will be special as this is where all the wins started back in 1995. 4: PACKAGE DEAL — After a near year-long study, the implementation of a new aero package for Sprint Cup cars will hit the track at Atlanta on Sunday with a smaller rear spoiler and other changes. 5: HAIL THE CHAMPION — Kevin Harvick is back in the familiar confines of an intermediate (1.5-mile oval) track, the kind where he won twice in his 2014 championship season in the No. 4 Chevrolet. 6: SUBSTITUTE PART 2 — Regan Smith will pick up his second ride as a sub for suspended Kurt Busch in the No. 41 Stewart Haas Racing Chevrolet. If he can pull off a top 15 he could earn more races starting next week at Las Vegas. 7: COUSIN CARL — The most talked about team switch last season was Carl Edwards moving from Roush Fenway Racing to Joe Gibbs Racing. Edwards admits he was nervous at Daytona. This week he should start to get in the groove. 8: TOYOTA TIME — There would be no better time for Toyota to get a win than at Atlanta. Last season, Toyota won just two points races. They need to show they are back with more power this season. 9: ROUSH RACING — I can’t remember the last time Roush Fenway Racing has gone through such a prolonged slump at the Sprint Cup level. Since Edwards battled Tony Stewart for the championship in 2011, the RFR Fords have been lagging behind. 10: DANICA WATCH — Atlanta is the site of Danica Patrick’s best Sprint Cup finish — a sixth place last season. With growing questions about her progress, she needs to make a statement on Sunday. Joey Logano will start from the pole in Sunday’s Folds of Honor QuikTrip 500 at Atlanta Motor Speedway, but I am picking his Penske teammate Brad Keselowski to win. The No. 2 Ford wasn’t even near the quickest in Happy Hour practice on Saturday — 26th fastest at 185.375 — but the team has shown in the past that it can up its game come race time on Sunday. Add in the fact that Keselowski wants to show his boss Roger Penske that he can match Logano’s speed this weekend. Plus there that old racing adage: If you can’t win, at least beat your teammate. And Keselowski will want to do just that. Watch for the No. 2 Penske Ford in Victory Lane. Martin Truex Jr. now has a full season of working with the No. 78 Furniture Row Racing Chevrolet team. He knows how to win at the NASCAR Sprint Cup level and could well surprise on Sunday afternoon. Truex also has a good record at the 1.5-mile Atlanta Motor Speedway oval. He has two top-five finishes — a third in 2013 and a fourth in 2012 — in the past three Atlanta races.